International Journal of Research in Health Sciences,2014,2,3,853-859. 1-Department of Orthopaedics, 2-Department of Radiodiagnosis, 3-Department of Anaesthesiology, Mamata Medical College/General Hospital, Khammam, Telangana, INDIA. Background and Objectives: Proximal third fractures of femur like intertrochanteric and subtrochanteric fractures, are a leading cause of hospital admissions in elderly people. The number of such admissions is on a raise because of increasing life span and sedentary habits. Conservative methods of treatment results in malunion with shortening and limitation of hip movement as well as complications of prolonged immobilization like bed sores, deep vein thrombosis and respiratory infections. This study is done to analyze the surgical management of proximal third fractures of femur using Proximal Femoral Nail. 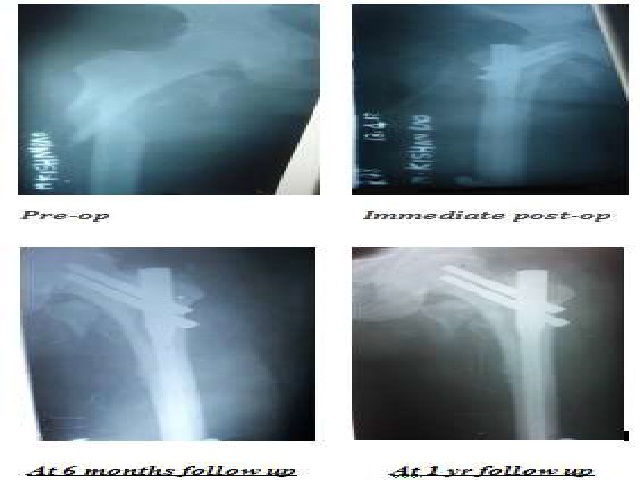 Materials and Methods: This is a prospective study of 40 cases of fresh trochanteric and subtrochanteric fractures admitted to Mamata general Hospital, Khammam, A.P., From Aug 2010 to Sep 2012. Cases were taken according to inclusion and exclusion criteria i.e., patients with Proximal third fracture femur above the age of 18yrs. Medically unsuitable and patients not willing for surgery were excluded from the study. Results: In our series of 40 cases there were 24 male and 16 female, maximum age of 85 yrs and minimum age of 20 yrs, most of the patients were between 60 to 80 yrs. Mean age of 53.9yrs. 45% of cases were admitted due to slip and fall and with slight predominance of right side. Out of 40 cases, 10 were trochanteric and 30 were subtrochanteric. In Trochanteric class 60% were Boyd and Griffin type 2, in subtrochanteric class 40% were Sinsheimer type 3a and 30% were 2b. Mean duration of hospital stay is 19.62 days and mean time of full weight bearing is 10.6 wks. Out of 40 cases 5 cases expired before first follow up time of 6 wks and 5 cases were lost for follow up. Out of 30 remaining cases 6 were Trochanteric and 24 were subtrochanteric. Good to excellent results are seen in 100% cases of trochanteric fractures and 91.5% cases in subtrochanteric fractures. Conclusion: From this sample study, we consider that PFN is an excellent implant for the treatment of Peritrochanteric fractures. The terms of successful outcome include a good understanding of fracture biomechanics, proper patient selection, good preoperative planning, accurate instrumentation, good image intensifier and exactly performed osteosynthesis.